The Republic of Haiti is the poorest state in the Western Hemisphere. The country covers the western part of Hispaniola island in the Caribbean. Since Haiti has been repeatedly subjected to natural disasters, the local telecommunications system is not in a very good condition. 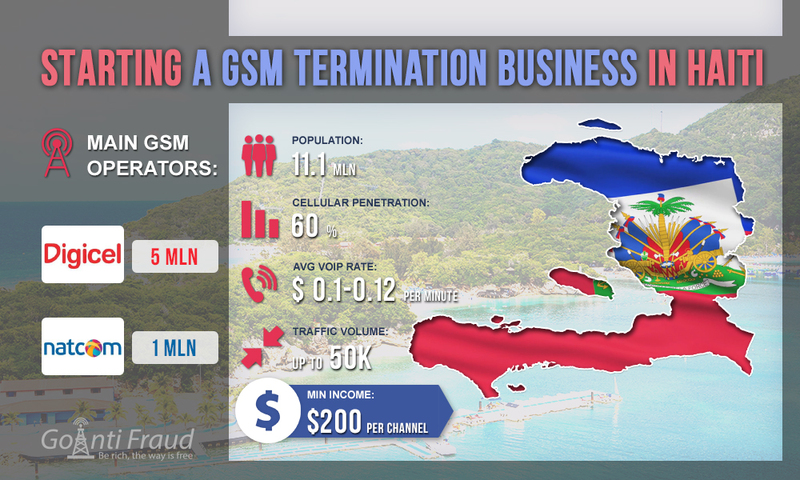 Nevertheless, the mobile sector is fairly well developed here, which, in combination with a high average rate ($0.09- $0.15 per minute of conversation), allows gaining impressive amounts of profit on VoIP termination. Natcom (about 1 million subscribers). Digicel appeared in Haiti in 2006, but has gained the largest subscriber base since then. Natcom was established in 2010, so the number of its clients is 1 million so far. 99% of connections in the country are prepaid. Many residents of Haiti use 2 SIM cards at once, since the prices of starting plans are minimal. Tourists often come to Haiti, so a lot of international traffic is generated here. Tariffs for local cellular communication are not high - $0.05 per minute on average, which allows earning on landing of voip calling minutes a minimum of $200 from each GSM gateway channel. Power outages often occur in the Republic of Haiti. Keep this in mind when doing your business. It is important to make the maximum use of the time for gateways operation when power is on. For equipment, it is better to use mains power filter, so that it does not fail at a sudden power outage.